Rising oceans might be years away but state agency says preparatory action must be taken now. HALF MOON BAY — Failure to address sea level rise now means we’ll pay the price for our inaction later. This was the message of the California Coastal Commission’s latest update on sea level rise. Commissioners and commission staff discussed next steps in sea level rise planning at the state agency’s November meetings in Half Moon Bay. The discussion was an extension of the commission’s adoption of a sea level rise guidance document in August 2015. The Coastal Commission, in its efforts to realize ongoing and evolving policies on sea level rise, has been working with local governments and stakeholders through outreach, training events and grant programs. Through it all the commission has been urging citizens and government agencies across the state to take sea level rise, coastal flooding and other environmental concerns seriously. “Global sea level rise is accelerating and extreme storm events are increasing in intensity, both of which are exacerbating coastal shoreline hazards that the Commission must address, including coastal erosion and flooding,” the commission stated in its current strategic plan, which is active through 2018. Sea levels have already risen by at least 7 inches in the past century, according to the commission’s sea level rise policy guidance document. Global sea levels could increase by another 39 inches by 2100, according to the Coastal Commission and Intergovernmental Panel on Climate Change. The mean sea level in California has increased by 8 inches since the early 1900s. 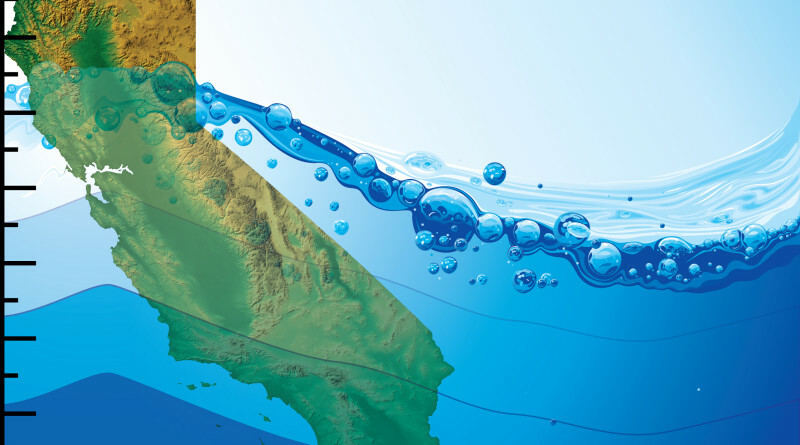 A National Research Council study published in 2012 predicted sea levels along the California coast are expected to increase by 17 to 66 inches by 2100. Kelsey Ducklow, a climate change analyst with the Coastal Commission, said cities should have at least one plan in place to prepare for 5.5 feet of sea level rise by 2100 – even though current projections might actually prove to be conservative. “Evolving science continues to suggest that sea level rise could be higher than previously projected. Understanding the ranges of impacts from worst-case scenarios, as well as from daily conditions versus extreme events, gives a more holistic view of what communities should prepare for,” Ducklow told commissioners. Both Ducklow and commission staff stated its adopted guidance document should be a conversation starter. Cities, government agencies and other jurisdictions should start proactively planning for sea level rise now, according to commission staff. Efforts to address sea level rise should also include adaptive measures, allowing jurisdictions to adjust policies depending on what actually happens along the coast (compared to what is predicted). Senior Deputy Director Jack Ainsworth said while efforts to address sea level rise are noble and worthy, so much more still needs to be learned. Cities and counties should, accordingly, avoid knee-jerk reactions when planning for sea level rise and instead enact adaptive management strategies, Commissioner Martha McClure said. Adaptive management strategies would allow local jurisdictions to still have an effective plan in place whenever future realities do not match forecasted scenarios. Jack Liebster, a planning manager with Marin County who spent the five years working on sea level rise policy, said state officials must avoid piecemeal responses to rising oceans and instead focus on holistic responses. “Solving the problem will not be done by piecemeal, ad hoc, permit-by-permit actions. It will require a long-term commitment, community-based, comprehensive, local and … compassionate planning,” Liebster told commissioners. Commissioner Mary Shallenberger was in favor of future addressing sea level rise and warned against delaying action. “One of our jobs as a commission is not to fall subject to we can put things off, we can put the planning off, we can push it out in years because the sea level rise hasn’t happened yet,” Shallenberger told commission staff. Coastal Commission Chair Steve Kinsey suggested the Coastal Commission should be proactive in addressing sea level rise through legislative resolution. “If the legislature can set the table with clear policies, I think that would be helpful,” Kinsey said. The Local Coastal Program (LCP) Local Assistance Grant Program, specifically, aims to assess needs in urban/rural areas and educate the public of adaptive planning. To date 29 jurisdictions were awarded nearly $4.5 million in funds through the LCP Local Assistance Grant Program to complete sea level rise vulnerability assessments and adaption reports, among other activities. Another $500,000 in grants is available; the Coastal Commission anticipates issuing a request for proposals at some point in 2017. San Diego County, Oxnard and Santa Barbara (city and county) were among the 16 jurisdictions awarded grants to conduct sea level rise vulnerability assessments. The city of Santa Barbara, Newport Beach (which recently completed an LCP Implementation Plan) and San Diego County were among the 13 jurisdictions granted funds for various LCP projects. Only two jurisdictions were awarded grant funding for adaptation plans. Coastal Commission staff stated they would continue to work on providing tools for local governments to prepare sea level rise vulnerability assessments. The Coastal Commission met Nov. 2-4 at Oceano Resort Hotel in Half Moon Bay. Arithmetic says that 66 inches over the next 84 years is over 10 times the rate of 8 inches since 1900. The San Francisco tide gauge shows that the rate of sea level rise has varied since 1885 when records began. The rate over a 30 year period has been as high as 4 mm/yr in the 1880s and as low as a negative -0.5 mm/yr in 2011. The current rate over the last 30 years is 1.5 mm/yr and the overall rate since 1885 is also 1.5 mm/yr. The obvious question to ask is, when will the rate of sea level begin to accelerate to values needed to achieve the predictions from the National Research Council? Damn, I hate it when Statistics get in the way of Proclamations from the Government. I’d sure like to hear their answer to your probing question. Another alarmist in action! 7″ in 100 years, .007″ in 1 year, or not even a 10th of an inch in 10 years! Average human hair is 0.004 thick, so in 1 years time the sea rises two hairs or less in height! A garbage article spouting from a Climate change knucklehead! Anyone can spin data to their cause. This is just horse pucky! You know, as a reporter you ought to ask hard questions when reality and what’s been written and said don’t agree. Really? “Could Change Rapidly” The 1906 earthquake can be seen in San Francisco’s tide gauge record, but it didn’t run the rate up to 20 mm/yr which is what’s needed to get to the projections in the report. You might ask the scientists why it didn’t happen then. I’d like to know what they would say. Extrapolations are like target shooting. And as the saying goes, “If you can’t hit the broad side of a barn at 25 feet, you’re not going to hit the target at 100 meters.” Climate projections of all kinds since Dr. James Hansen’s 1988 congressional testimony have largely failed. Why should anyone believe the semi-empirical assessment from the commission? “However, this suppression will not continue indefinitely” and “sea level will continue rising, likely at an accelerated rate” Really a blue sky theory is turned into an assertion and likely acceleration. I’d love to see a good science reporter pick some of this stuff apart. You know what? The United States goverment, for at least the next four years, is going to change direction. Good hard hitting reporting on topics like this will be the order of the day. I look forward to a future where journalists root out claims and predictions that aren’t supported by demonstrable facts. First the Hockey Stick believers that Al Gore roped in on his BS concept relating to temperature being on the rise around the globe, when Clinton approved the removal of many high altitude weather stations located on mountain tops due to the need to divert monies to social programs. That caused the data to become skewed, when only lower positioned weather stations in warmer regions were now reporting. Same BS here, to help justify someone’s political/financial position. The sea level goes up a few hairs in height, then down a few hairs as the earth cycles thru its normal rotation and oscillation. California’s Coastal Commission is still peddling Al Gore’s message. It justifies their existance. Heck if Al Gore believed his own BS, then he would noth have purchased the high rise building on the waterfront in San Francisco. Copied from Investor Business Daily..Five Ways We Know Al Gore’s Been Running A Global Warming Racket…Fraud: Ten years ago Monday, Al Gore said we had only a decade left to save the planet from global warming. But Earth has been doing just fine. Why do we listen to this man? Ten years later, he’s probably hoping that everyone has forgotten about his categorical statement. One, Earth hasn’t warmed in nearly 20 years. Yes, 2015 supposedly “smashed” the previous temperature record. But actually it was the third-warmest year on record — or maybe “not even close to the hottest year on record,” says James Taylor of the Heartland Institute. The global average temperature, a devilish thing to determine anyway, depends on what temperature readings are being used and who is “adjusting” the data to fit their political purposes. The scientific community cannot be trusted to provide honest numbers. And 2015 was, after all, an El Nino year. Higher temperatures, with no link to man’s activities, were expected. Two, predictions that climate change — the rebranding of “global warming” when it turned out that predicted warming wasn’t happening — would cause catastrophic weather damage haven’t panned out. He cannot claim that his deadline has been extended because some governments have forced their citizens to cut carbon dioxide emissions. CO2 levels keep climbing and now exceed 401 parts per million in the atmosphere. It is simply not the dangerous greenhouse gas we’ve repeatedly been told it is. Four, in the mid- to late-2000s, Gore repeatedly predicted that an ice-free Arctic Ocean was coming soon. But as usual, his fortune-telling was wrong. By 2014, Arctic ice had grown thicker and covered a greater area than it did when he made his prediction. Five, Gore’s movie, which somehow won an Oscar, was found by a British judge to contain nine errors. The judge said it could not be shown to students unless it included a notice pointing out the errors. Gore will never apologize for peddling deceit, never admit he was wrong. Best thing to do is ignore him. Time to terminate the high paid bureaucrats reporting this kind of “it could happen in 100 years maybe” balony.